We always need some better display and storage stations at hallway and entryway for impressive decorative and clutter-free looks of our home interiors!! More organized a home is, higher would be the decorative values! So the item of furniture that is considered vitally important for both organized and decorative looks of home hallway and entryway, is always a hall tree! Here we are to show you that how you can get a hall tree almost at no-cost, just recycle the rustic free pallets and build your own mind-blowing hall trees having custom features to suit best to your needs! 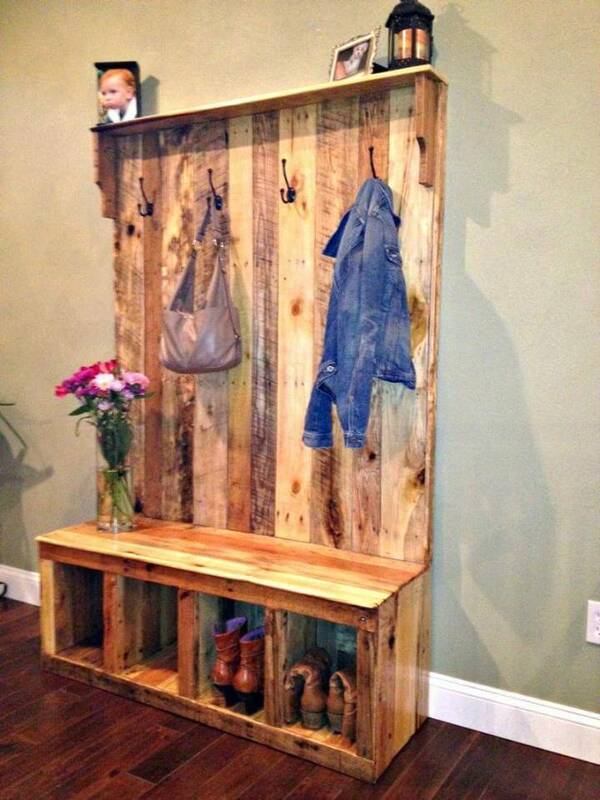 Amaze yourself with this DIY wooden pallet hall tree or coat rack or shoe rack, a purely handcrafted edition of wooden hall tree! By taking into account the required storage space, this lasting wooden model of hall tree is made! Separate apart the pallet skids into longer single slats and then reestablish them building your targeted model of hall tree! 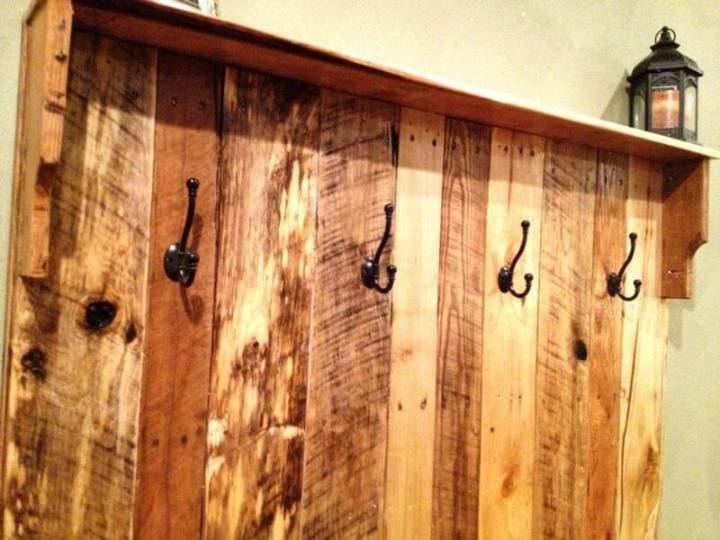 Provide the ultimate weather protection to your finally handcrafted pallet hall tree by giving some protective stain or wood sealer coats and don’t forget to add the hardware hooks for your hanging needs!! This very special design of handmade pallet hall tree was available on Etsy by Palletinnovation shop by Luke Rompel but has been sold out!! 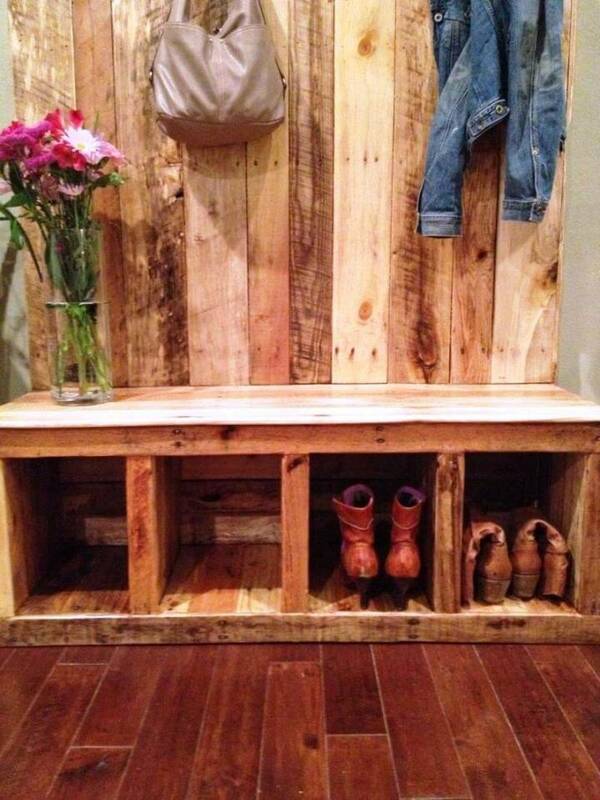 Now you can simply add it in your to-do list of weekend’s DIY pallet projects!!! The very first mission is to achieve a pile of separated pallet lengths, so dismantling of pallets would be the very first step! Clean the pallets and start taking them into pieces using a reciprocating saw, pry bar will also rock but the dismantling time would be extended!! Put together the separated pallet slats to build a big wooden wall first, glue and nail the pieces together to ensure lasting assemblage!! Now build a cubby and divide it into equal storage compartments by adding dividers! 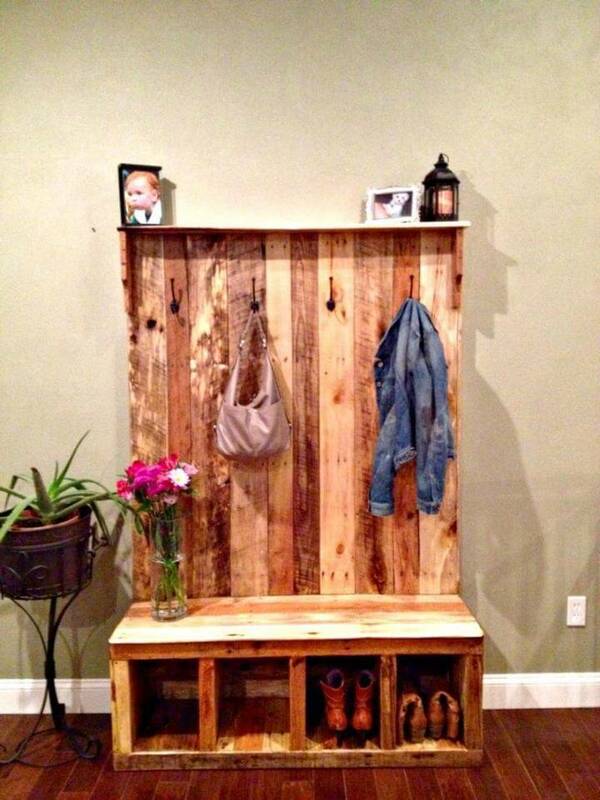 Add it to bottom side of that pre-built wooden wall or solid wooden board for a gorgeous hall tree design!! Add row of metal hardware hooks and install a shelf also at the same time!! Here this hall tree has been topped up with an 6″ shelf which can hold the decorative centerpieces, mural and photo frame you want to display and other items of interest!! Plan a durable finish for weather protection, here the wooden surfaces has been treated with polyurethane for both weather protection and captivating sparkle on the wood grains!! The bottom compartments would behave like a pallet shoe rack and it would also provide sitting space like a bench where you can sit comfortably while taking off or wearing your favorite shoes!! Your ties, handbags, scarves and coats can be hanged easily over the hooks, a simple and functional design of pallet hall tree, built to inspire and last!! !